After being accused of “saffronising education” and “doctoring texts” when they were in power, it was the BJP’s turn today to make similar accusations. The BJP accused the Union Human Resource Development Minister, Mr Arjun Singh, and the Delhi Chief Minister, Ms Sheila Dikshit, of trying to “impose a distorted view of history on schoolchildren through textbooks”. The Municipal Corporation of Delhi (MCD) today asked the Delhi Government for the proposal presented before the latter for trifurcating the corporation. After the anxious wait for class XII results, students are now readying themselves for a more gruelling battle - seeking admission to Delhi University. The Delhi Lt-Governor, Mr Vijai Kapoor, has ordered the transfer of eight DCP-level officers with immediate effect. The Economic Offences Wing (EOW) claims to have arrested a bogus finance agent, identified as Tanvir Rashid, for cheating innocent people by promising quick loans without any surety or guarantor. The PHDCCI has urged the Government of Delhi to allow shops and shopping malls to remain open on all seven days and up to 10 pm. 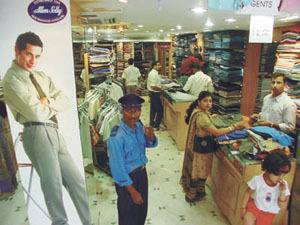 In a representation to the Chief Minister, the PHDCCI has said opening the shops on all seven days would lead to generation of additional income, creation of additional jobs, particularly for unemployed youth, and higher tax collection for the state besides making it more convenient for shoppers. The Delhi Sikh Gurdwara Management Committee (DSGMC) today honoured Union Minister Jagdish Tytler with a saropa. The DSGMC president, Mr Prehlad Singh Chandok, made the presentation. The Delhi High Court has refused to stay the election process of the Bar Council of Delhi and ordered the completion of counting by June 30. A Division Bench, comprising Justice Dalveer Bhandari and Justice R. C. Jain, gave the directions while issuing notices on an appeal against the May 14 order of the court’s single judge. Physical and mental handicaps failed to deter these special children, who got together recently to put up a show highlighting their skills in dance, drama and music. The number of diarrhoea patients is increasing in Noida. More than 90 per cent of the patients in the OPD of the government hospital here have loose motions and vomit up whatever they eat. The number of patients has become so unmanageable that they are being admitted to the isolation wards along with the TB patients. Ironically, it is the poor slum dwellers who are bearing the brunt of it and other water-borne diseases. While the hike in sector rates of residential plots proposed by the Ghaziabad district administration has evoked strong protests from the people, the district administration, it is understood, is going ahead with proposing 15 to 20 per cent hike in agricultural land circle rates in Greater Noida villages. As many as 20 persons suffered serious burns while 12 heads of cattle perished in a gas cylinder explosion at Phallaunda village in Rabupura late on Monday night. The victims were rushed to Bulandshahr Hospital. The condition of six of them is serious. The New Delhi district police claimed to have arrested one person and seized a huge quantity of pirated VCDs worth Rs 80 lakh from his possession in the Palika parking area. 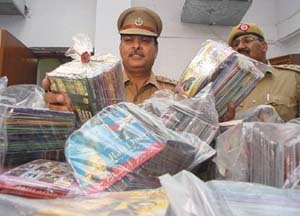 The police got information that certain persons were involved in supplying pornographic and pirated VCDs in Palika Bazar from the Jama Masjid area. The Allahabad High Court has ordered the district and sessions courts, Gautam Budh Nagar, to start functioning with immediate effect. While the authorities in Delhi have started imposing fine on the people smoking in public, the health authorities here seem to wink at the ‘No Smoking’ rule. Cricket legends Kapil Dev and Krishnamachari Srikkanth today launched The Forest, the first fully air-conditioned ultra luxury apartments in Noida. The mini-secretariat building at Sector-12 here is likely to be ready by June-end. The building will house offices of various district officials, including the Deputy Commissioner and the district police chief. Estimated to come up at a cost of Rs 12.5 crore, it will have two buildings. The BJP has alleged that the books for grades six and seven, which are likely to be introduced in government schools in the national Capital and were prepared by the State Council of Educational Research and Training (SCERT), are “full of factual errors and give a biased and anti-national view of history”. The motive behind these changes is to restore the texts “spreading the Communist dogma which was not possible after the National Council of Educational Research and Training (NCERT) replaced the old textbooks in 2002-2003,” he said. Incidentally, Dr Harshvardhan also released a report on these texts prepared by certain historians, whom he refused to identify. Dr Harshvardhan said the new textbooks give a totally false account of Sikhism. The development of Sikh religion and the life of Guru Nanak has been confined to just 16 lines in the history book for the seventh standard, he said. He said there is no mention of the “supreme sacrifices made by various Gurus like Guru Arjun Dev, Guru Tegh Bahadur and Guru Gobind Singh. One of the greatest rulers of India, Maharaja Ranjit Singh, has been totally ignored, which is shameful”. The much-hyped policy of introducing Delhi’s children to their local heritage has “also proved to be a sham” as the only Sikh shrine mentioned by the books is Majnu Ka Tilla, while the famous Gurdwara Rakabganj, Gurdwara Bangla Saheb and Gurdwar Asheesh Ganj (where Guru Teg Bahadur was killed following Aurangzeb’s order) find no mention at all, said the BJP leader. Dr Harshvardhan went on to add that Jainism too has been presented in a distorted form and the old discontinued NCERT textbooks written by R. C. Sharma, which included disparaging remarks on Jainism and Bhagwan Mahavira that were later deleted under the Vajpayee government, have been included in the new Delhi school textbooks. Citing examples, he said, the existence of the 23 Tirthankaras, who came before Bhagwan Mahavir, has been denied in the textbook for the sixth standard. The authors of the new books have also completely disregarded the glorious achievements of ancient India in the field of physics, astronomy, mathematics, medicine, surgery, chemistry and other branches of science, Dr Harshvardhan alleged. The textbooks prepared by the SCERT do not even mention the names of Aryabhatta, Bhaskara and others, he alleged. The texts carry the stamp of “Marxist philosophy”. The Delhi BJP chief said that there is no mention of Pt. Ravi Shankar or Pt. Allauddin Khan in the pantheon of India’s great art figures, though the “Communist propaganda front, IPTA”, has been lavishly eulogised. This demand was made in the all-powerful Standing Committee of the corporation in which the Leader of the Opposition, Mr Vijender Gupta, tabled a representation, demanding a copy of the proposal presented before the Cabinet of the NCT Government of Delhi. On the basis of the proposal, the government has decided to divide the corporation in three parts. The Standing Committee members have unanimously decided to study the proposal and constitute a sub-committee to prepare a report in connection with the trifurcation of the corporation. Moving the representation, Mr Vijender Gupta alleged that by trifurcating the corporation the Delhi Government was curtailing the powers of the corporation. The proposal was not made after a thorough study of the national Capital’s geography and the requirements of the citizens. According to the proposal, the corporation would be trifurcated after making initial amendment to the DMC Act. No separate Act for the new corporations had been enacted so far. The proposal said the corporation would be divided into three parts – East, North and South. The total population of South Delhi is 55 lakh. Only 10 members in the Standing committee had been proposed in this new corporation. Twelve members had been proposed for a population of 44 lakh in North and eight members for a population of 32 lakh in the East Delhi corporation. Admissions to the one of the country’s premier institutions, Delhi University, will begin from June 3, at 12 centres across the city. The centralised admission forms, through which students can apply in several colleges for more than one course simultaneously, will be available for Rs 15 per copy, up from Re 1 last year. The university, which attracts a large number of students from across the country, claims the centralised forms will ease the pressure on students who until recently had to run from one college to another to fill forms. The centralised forms will be available in the university’s South Campus, Gargi College near Siri Fort Auditorium, Acharya Narendra Dev College in Kalkaji and PGDAV College near Ashram. In West Delhi, the forms can be procured from Deen Dayal Upadhyay College in Hari Nagar and Shyam Prasad Mukherjee College near Punjabi Bagh. In East Delhi, the outlets are Vivekanda Mahila College near Vivek Vihar and Dr Bhimrao Ambedkar College in Gita Colony. In North Delhi, the forms will be available at two centres, Kirorimal College and the office of Dean, Students Welfare, on the North Campus. In Central Delhi, the outlets are Kalindi College near East Patel Nagar and Zakir Hussain College near New Delhi Railway Station. A student can apply simultaneously to eight colleges and ten courses, using one form. The last date for submitting the filled up form is June 16. The first list of the selected students and their allotted courses will be put up on June 20. The second list will come four days later. To assist the students in filling up forms and for answering other admission related queries, the students’ unions have announced the deployment of volunteers at all the 12 application outlets in the city. The Deputy Commissioner of Police (IGIA), Mr M. M. Oberoi, has been shifted as Deputy Commissioner of Police (Central) while the Deputy Commissioner of Police (Central), Mr Rajesh Khurana, has been transferred as Deputy Commissioner of Police (North). The Deputy Commissioner of Police (North), Mr Sanjay Beniwal, who has been promoted, will take over as the DIG, Mizoram. The Deputy Commissioner of Police (Crime and Railways), Mr Deependra Pathak, has been transferred as Deputy Commissioner of Police (South-West) while Deputy Commissioner of Police (South-West) Tajendra Luthra has been posted as Deputy Commissioner of Police (Crime and Railways). The Deputy Commissioner of Police (North-East), Mr Praveer Ranjan, has been posted as Deputy Commissioner of Police (South), following the shifting of Deputy Commissioner of Police (South) Vivek Gogia to FRRO. Additional Deputy Commissioner of Police (North-East) Anurag Kumar has been promoted as Deputy Commissioner of Police (North-East) and Additional Deputy Commissioner of Police (South-West) D. C. Srivastava has been posted as Additional Deputy Commissioner of Police (North-East). Mr Srivastava will be replaced by Additional Deputy Commissioner of Police (Special Branch) Shalini Singh. A complaint was filed by one Sanjeev Dhawan that AMX Financial Services Consultancy had accepted Rs 9,000 as an advance for arranging a loan of Rs five lakh. In need of a loan, Dhawan had met Tanvir in his office in the Okhla area and handed over the title papers of his house for the purpose. Later, however, when Dhawan tried to contact Tanvir he deliberately avoided him, disclosed the sleuths of the EOW. Finally, surveillance was maintained on Tanvir’s office and residence when Dhawan complained to the EOW. Later, Tanvir was nabbed from his office in the Okhla area and more than 200 loan-seeking files were seized from his office. As many as 25 persons, who had paid commission on loans to Tanvir, were identified. The officials of the EOW informed that Tanvir had deposited over Rs six lakh in the account of City Home Financial Services, which was frozen after his arrest. In another case, the police today claimed to have arrested one Rajender, alias Raju, who was involved in the manufacture of illegal computer accessories at his Pandav Nagar rented accommodation. The police also claimed to have seized goods worth nearly Rs one crore from his possession. The accused used to manufacture toners, cartridges and other computer accessories of Hewlett Packard. The PHDCCI has urged the Government of Delhi to allow shops and shopping malls to remain open on all seven days and up to 10 pm. In a representation to the Chief Minister, the PHDCCI has said opening the shops on all seven days would lead to generation of additional income, creation of additional jobs, particularly for unemployed youth, and higher tax collection for the state besides making it more convenient for shoppers. Highlighting the problems of traders in Delhi, the PHDCCI has pointed out that shopping malls in the NCR are operating all seven days and up to late hours in the evenings, leading to customers shifting from Delhi to places like Gurgaon and Noida. Consequently, Delhi commercial centres are losing business and the Delhi Government is losing revenue. At present, the Delhi Shops and Establishments Act imposes restrictions on the closing and opening hours of shops in the NCT of Delhi. The PHDCCI has, however, pointed out that Section 4 of the Act empowers the state government to exempt them from operation of any provision of the Act. In exercise of the above power, the state government has been granting exemption to shops on a case-to-case basis, particularly with respect to opening and closing hours and the operation of a seven-day week, with a stipulation on the working hours of the employees, the rest interval, the shifts and the weekly off day. The PHDCCI has recommended that instead of granting exemption to employers of individual shops with respect to the opening and closing hours and the seven-day work norm, general exemption can be granted to all shops in Delhi from these provisions, subject to their adherence to labour laws. This will help Delhi retain its place as the prime shopping destination in the NCR. Most of the countries allow the shopping malls to remain open seven days a week to cater to the requirements of different customers. Developed markets like Singapore, Hong Kong etc also regulate employment practices, which is the underlying objective of the legislation. As has been done by the Government of the NCT of Delhi to alleviate the difficulties faced by IT enabled services, by issuing a notification exempting the establishments from the provisions of Section 11, Section 14, Section 15 and Section 16 of the Delhi Shops and Establishments Act, a similar notification is required to be issued to remove the difficulties and constraints being faced by the shopkeepers in the NCT of Delhi, the PHDCCI has recommended. A number of Sikh organisations had issued appeals to the community to vote against Mr Tytler in the Lok Sabha elections for his alleged complicity in the 1984 anti-Sikh riots. The DSGMC provided support to the Congress party by actively canvassing for its candidates during the recent Lok Sabha elections in the Capital. The move is likely to antagonise the Shiromani Akali Dal, which has been persistently demanding that the Congress leadership should not include Tytler in the Union Cabinet. On May 14, the high court had issued directions for the immediate appointment of a returning officer to complete the Bar Council of Delhi (BCD) election within three weeks. While dismissing a set of petitions challenging irregularities in the BCD, Justice B. D. Ahmed had said during the process of election the court would not entertain any petition concerning the election. Any aggrieved person could file a petition only after the election to the body of advocates of the Delhi High Court was over. The high court in October last year had a Special Committee constituted by the Bar Council of India to take over the affairs of the Bar Council of Delhi after the expiry of its term to consider the issue of appointing a Returning Officer and continuation of the BCD electoral process that had been halted following allegations of bungling during counting. The ballot papers, which had been lying sealed in the high court guard room, would be handed over to the Returning Officer only after his appointment. The BCI constituted the Special Committee on October 13 under the Advocates Act, which comprises Additional Solicitor-General Altaf Ahmed as Chairman, lawyers R. P. Lao and Deshanand Gaur. On October 14, the high court had issued a notice to the BCI on a plea by a leading candidate in the BCD polls, seeking appointment of a Returning Officer to complete the council’s electoral process that had been halted due to the resignation of the Chief Polling Officer following allegations of bungling during counting. Mr Abhay Verma through counsel Sanjay Jain sought appointment of another Returning Officer so that the BCD elections could be taken to the logical conclusion. These children, who were enrolled for various workshops at the Four Steps, a school for children with special needs, gave ample display of their mettle and will power when they took the cue from each other in giving a fine performance. From the traditional lamp lighting ceremony to a drama titled ‘Rail gaadi’ and a solo dance number, these children were an example of a fine effort to beat all odds. The grand finale was the culmination of a month-long workshop aimed at enhancing the skills of these children. The annual summer workshop allowed the children to maximise their potential by engaging in their favourite pastime. It may be recalled that one of the TB patients, a 35- year-old woman, had died in this very ward on Saturday. About 30 patients were admitted to the government hospital in Sector-30 on Saturday and Sunday. Eight new diarrhoea cases had to be admitted in the hospital between 2 pm and 5 pm yesterday alone. Most of these patients have come from the slum clusters in Sector-7, 8 and 9. Many of them had first gone to the quacks but when their condition became serious, they were brought to the government hospital. The patients in the government hospital buy mineral water from the market as the hospital does not have a single functioning water cooler. The patients complained that they were not being looked after properly. It is seldom that the doctors visit the wards. One J.N. Pandya said his son was running 104 temperature but there was no one to attend to him. Dr R N Agarwal said that she was overworked as she had to perform a number of duties even on Sunday such as taking care of VIP cases, postmortem, OT camp and even operations. Meerut: Diarrhoea has become a serious health threat in Meerut. 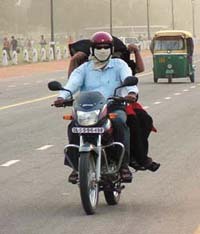 A large number of patients can be seen in each locality in the city. The medical officials say that the cases of diarrhoea might increase. Children are affected most. The district hospital admits at least a dozen children every day. According to the data available with the district health department, 28 new patients down with diarrhoea were admitted to the district government hospital on Sunday evening while 15 patients hospitalised on Monday; another 17 on Tuesday. The patients were of all age groups. Doctors and the staff of the P L Sharma District government hospital are unable to tackle such a large number of patients for want of proper facilities. Most of the patients admitted to the district government hospital are from Brahampuri, Railway Road, Bhavanpur village, Rashid Nagar, Kidvai Nagar, Ban Batan, Purva Shaikh Lal, Subhash Nagar, Old Mohanpuri, Jai Devi Nagar, and most of the slum localities of the city. For over a fortnight, 10 to 12 patients of diarrhoea were admitted to the district government every day. The same situation prevails in Meerut Medical College where five to six patients were admitted daily. The number increased suddenly after the torrential rains and storm in the area last week. This includes a number of children and infants below five years. A paediatrician of western UP, Dr Rajiv Tavetia, advised people to use boiled water and not to have food stored in the open. Dr Tavetia said that the cleanliness is the best possible prevention in case of diarrhoea, and the patient should take ORS solutions for some days. Meanwhile, a special emergency ward for the patients was also established in the district hospital. An increase of 20 per cent has already been proposed in the rates of residential plots. Now an increase of about Rs 4 lakh per hectare is being proposed for agriculture land. According to sources in the Greater Noida sub-registrar’s office, the circle rates for Surajpur-Lakhanawali Road have been fixed at Rs 3,000 per sq m, from Devi Mandir to Thana at Rs 3,600 per sq m, from Gole Chacker Kasna Mode to Devi Mandir, Surajpur and other area Rs 3,000 per sq m and for Noida-Dadri Main Road Rs 4,000 per sq metre. In case of Rampur, Jagir, Tughalaqpur, Gajraula, Birondi Chakarsenpur, Kubira and Habibpur, the rates have been increased from Rs 1,500 to Rs 1,800 per sq m.
A hike of 20 per cent is likely to be made in the circle rates for the areas of Gulistanpur, Suthiyana, Shahpur, Goverdhanpur, Jaitpur, Mathurapur, Hafizpur, Mandi and Shyam Nagar. This would result in an increase from Rs 1,000 per sq m to Rs 1,200 per sq m.
The explosion occurred in Karkalli Jatav’s house in Jatvan Mohalla while food was being cooked on the leaking cylinder. In a few seconds, the cylinder caught fire. Karkalli then threw it out in the open. As it landed, the cylinder exploded with a bang, charring Karkalli, Lohar Singh, Budh Singh, Bhagat Singh, Shiv Charan, a woman, Mithlesh, and many others. The explosion was so powerful that the burning pieces landed in far-off houses, causing fire there also. Subsequently, cattle sheds in different houses also got engulfed in the blaze. As many as 12 heads of cattle had perished. Though the villagers had informed the fire brigade, no fire tender reached during the night. The New Delhi district police claimed to have arrested one person and seized a huge quantity of pirated VCDs worth Rs 80 lakh from his possession in the Palika parking area. The police got information that certain persons were involved in supplying pornographic and pirated VCDs in Palika Bazar from the Jama Masjid area. A team was constituted to nab the suspects. The team arrested a person who was later identified as Gyanendra Kumar, alias Boby (33), resident of Khari Baoli. His subsequent interrogation led to a raid in Khari Baoli from where as many as 4,680 pirated VCDs and 250 pornographic VCDs were seized. Rajan Saini, 30, a businessman, was shot at by unidentified assailants near Keshavpuram Anaj Mandi in North-West Delhi today. The incident took place this evening when Rajan and his friend Ram Kishan were going home after closing their shops from Keshavpuram Anaj Mandi. The assailants who were in a Maruti car opened fire at him injuring him seriously. He has been admitted to Sunder Lal Jain Hospital. An attempt to murder case has been registered, police said. With the arrest of one person, the Central district police claimed to have solved as many as six cases of vehicle theft in the Paharganj, Connaught Place and Mandir Marg areas. One button-actuated knife was seized from his possession. Based on information, the police intercepted one motorcycle (DL-7SJ-3923) near the Chelmsford road picket and nabbed the accused, who was later identified as Rajesh, alias Danny, resident of Ghaziabad. A communication from the High Court Registrar, Mr O.N. Khandelwal, was received in the court of Addl. District Judge. The High Court order was welcomed by the employees and advocates alike. District Bar Association president Yoginder Bhatti said that the work in the courts had been resumed. He said all the cases and files, transferred to Ghaziabad courts, had now been called back. He said the new District Judge had been appointed who was expected to join duty by June 7. It may be recalled that as a sequel to the denotification of the GB Nagar District by the state government on February 13, the work of District and Session Judge was also transferred to Ghaziabad district court. This was, however, quashed by the High Court order of May 21. The court had averred that the UP Land Revenue Act, under which the districts were denotified by the UP government, could not apply to the functioning of the District Court. The ‘No Tobacco Day’ on Monday went nearly unnoticed in most parts of the state. Not a single case of imposing fine on the violators has come to light. It may be recalled that Haryana is one of those states where smoking is a big addiction. More than 60 per cent of people use tobacco in one form or the other in the state. It would be challenge for anyone to implement the rule, ‘No Smoking in Public’, says Mr Rishkant of Shaktivahini, an NGO here. He said when more than 75 per cent of the policemen smoke, how could one expect a common man to abstain from puffing in the open. He said the government would have to enforce the ‘No Smoking’ rule strictly, especially among the roadways and the police staff. According to a report, the Delhi government fined at least 1,707 persons found smoking in public between April 2003 and March 2004. Besides, the officials conducted raids in more than 15,000 places and checked over 70,000 vehicles during this period. On the other hand, there was not a single case of raid being conducted or fine imposed in Faridabad during the same period. ‘No Smoking’, it is the bus staff who break the rule first. Though the health department of Haryana released an advertisement, appealing people not to use tobacco or smoke on the ‘No Tobacco Day’ on Monday, no official function or campaign was launched in this connection. According to Dr Raman Kakar, a well-known physician, smoking was mainly responsible for diseases like TB and cancer. He says the campaign against tobacco or smoking should go on for 365 days a year and its main focus should be on the children and the youth as they are more likely to become addicts. According to the health experts and physicians, about 5,200 persons die in the country every day due to the diseases caused by smoking or use of tobacco. The apartment complex is adjacent to the over 300-acre Noida forest in sector 92, off the Noida-Greater Noida expressway. The inaugural ceremony was held at the Grand Hyatt in New Delhi on Monday. “The Forest has been envisaged keeping in mind the needs of the people who seek world-class ambience close to nature. With an all-round development, Noida residents desired premium housing options in the city. As a world-class and contemporary residential apartment, with a planned investment of Rs 110 crore, The Forest has been conceived to meet their demands,” says Rohtas Goel, Chairman and Managing Director, Omaxe Constructions Pvt Ltd. Renowned architects C P Kukreja Associates have been retained by Omaxe to design The Forest, that will have 105 ultra luxury apartments, offering a breathtaking view of the forest. Taking luxury to new heights, every apartment in The Forest will have a personal health club complete with sauna, steam.